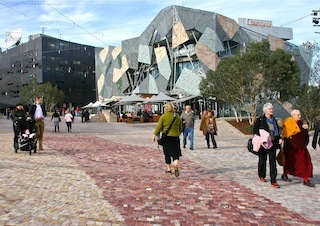 Federation Square Melbourne - called Fed Square by locals - is a buzzing cultural focal point. It is a lively place to hang out and meet, to watch people, events, explore the arts and enjoy the city celebrations. Its wide-open area surrounded by irregular cubist shaped blocks of buildings, a stage, nooks and spaces, including art galleries and museums, restaurants, cafes and bars. It is attracting a large number of visitors and locals and is a functional urban gathering place and city square. Fed Square evokes emotions. It is loved by many and disliked by some. It stuns, inspires and sometimes shocks people with its breathtaking architecture. For many it is ingenious and inspirational, others find it tasteless. 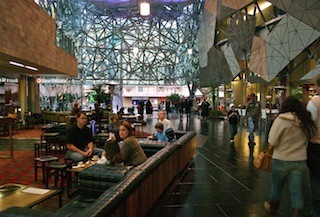 Nevertheless, it has become the central Melbourne piazza and much-used cultural space. Fed Square is located at a prime Melbourne location, alongside Princes Bridge, the Yarra, and Flinders Street Station  an easy to get to and very beautiful setting. It is one of the top two tourist attractions in Melbourne. You can turn up almost any weekend and find some sort of live music, multicultural event, festival or broadcasting of a sporting event at Federation Square. It is a hub for the Melbourne Jazz Festival, the Melbourne International Arts Festival, the Australian Open, the AFL finals, and much more. At ACMI you can visit the Screen World exhibition telling the fascinating story of everything film. At the Ian Potter Centre you can admire Australian art. There is also the NVG Kids Corner where children can enjoy creative installations and activities. There are various community events in the Atrium such as the Book Market for used books on Saturday. There is Poetry at Fed Square, with free afternoon readings every 2nd Saturday of the month, a motor show of glamorous classic, vintage and sports cars each last Sunday of the month. There are restaurants, bars, cafes, galleries as well as interesting shops in the Ian Potter Centre and in ACMI. 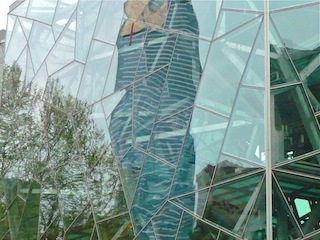 You also have a chance to get a behind the scenes look, taking part in a mid-morning tour of Federation Square! At the Melbourne Visitors Centre, on the corner of Swanston and Flinders Streets, you can find out what else is on in Melbourne. The Square is the cobblestoned organic heart of the complex, weaving together the cityscape, St Pauls Cathedral, the Yarra riverside and the various Federation Square buildings. It allows for large public gatherings of up to 15,000 people as well as intimate meetings and events. Surrounding the Square are a large number of cafes, restaurants and bars. The Melbourne Visitors Centre is located at the Flinders Street corner of the square. The Ian Potter Centre is the National Gallery of Victoria s Australian section, dedicated to the whole specter of Australian art. The Atrium connects the Ian Potter Centre and various spaces. It is a creative focal point for designers, artists, galleries, cafes and is used throughout the year by various community groups. The BMW Edge is a glass skinned modern amphitheatre with views of the Yarra River and beyond. The Alfred Deakin Building is home to the Australian Centre for the Moving Image (ACMI) and SBS, Australia's multicultural radio and television station. The Yarra building provides an enclosure for the plaza at its southern edge and links it to the riverside terrace with a variety of levels and adjacent stairways. One of the most fascinating aspects of Federation Square is the hidden Labyrinth, a maze of zig-zag surface corrugated concrete walls, which functions as a unique passive cooling and heating system for he Atrium and adjacent buildings, using only one tenth of the energy used by conventional air conditioning. Federation Square was construed with the bold aspiration to become a renowned world-class city square, following in the footsteps of the traditional city piazzas, but modern and fitting Melbournes image. Following a design competition, it opened in 2002. The Kulin Aboriginal peoples lived for thousands of years on the Federation Square site. The sides of the Yarra have been traditional indigenous meeting grounds. After white settlement, the site had been home to the city morgue, a fish market, corporate offices and rail yards  each of them separating the city from the Yarra. Federation Square has linked the Melbourne CBD with the Yarra River. The project had its share of controversy and heated debates over the design and costs, but has delivered the goods and has come good on the bold vision for a modern city place. It is named after the Australian Federation, which united the six British colonies of New South Wales, Queensland, South Australia, Tasmania, Victoria and Western Australia to form the Commonwealth of Australia in 1901. Federation Square Melbourne is one of the most complex and ambitious construction projects ever undertaken in Australia. It is the size of a city block and is built on top of a deck right over the numerous railway tracks into Flinders Street Station. It is made up of a series of interlocking and cascading spaces and shapes. Buildings open at all angles into the square and the city, creating surprising connections and nooks. Its fractal façade is based on triangular shapes that allow differentiation of individual buildings, whilst maintaining an overall coherence. It reflects the concept of Federation, the coming together of the separate parts that made up Australia, the idea of bringing disparate parts together into a coherent whole. Fed Square was the most awarded project in the history of the Royal Australian Institute of Architects (RAIA) Victoria, receiving five major awards for architectural and design excellence in 2003.